Catalina Island Yacht Club is one of the oldest yacht clubs on the West Coast. The historic club, located on the Avalon waterfront, was founded in 1924. 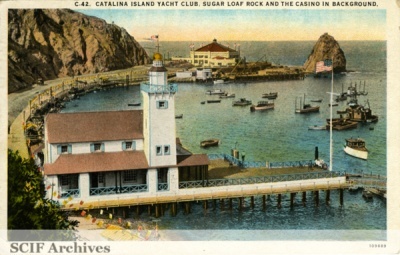 The Catalina Yacht Club [CYC] never got off the ground and was disbanded on May 15, 1914. In the meantime, the Sophia Yacht Club [SYC], formed in 1903, transformed into the Catalina Motor Boat Club, had begun construction of a facility at the beach. Although the first pilings and floor were placed as early as 1903, no further construction occurred. Boat builder, J. E. “Pard” Mathewson built his boat shop at the location, but the Avalon fire of 1915 destroyed the facility. In early 1924, James Jump and others decided to organize the new Catalina Island Yacht Club [CIYC]. The initial lease with the Santa Catalina Island Company was executed on February 1, 1924. Club Commodore was Jimmy Jump. Attorney was Ralph Bandini. Eighteen members of the Tuna Club provided the capital to build the yacht club facility utilizing the Catalina Motor Boat Club [Sophia Yacht Club] pier site. 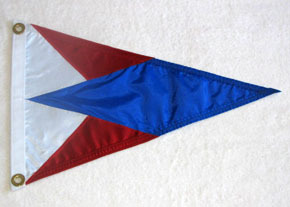 Classes of membership were set, with all property being vested in no more than 30 charter members, each of whom had to own or have a substantial interest in a boat. Each charter member provided a loan of $400 to the club. The Santa Catalina Island Company, under the direction of D. M. Renton, constructed a two-story frame club house on the existing pier foundation. Club Opening Day was August 23, 1924. By 1931 membership reached 270 before declining with the Depression. During the War years, from 1942 to 1945, Catalina Island was largely closed to the public and Catalina Island Yacht Club facility was used by the Navy and Merchant Marine. Catalina Island Yacht Club Club members have included many well-known Hollywood personalities including Jack Warner, Rudolph Valentino, Tom Mix, James Cagney, and Darryl Zanuck. The iconic clubhouse is among the most important and photographed landmarks on the Island of Catalina. This page was last edited on 9 April 2017, at 09:23.